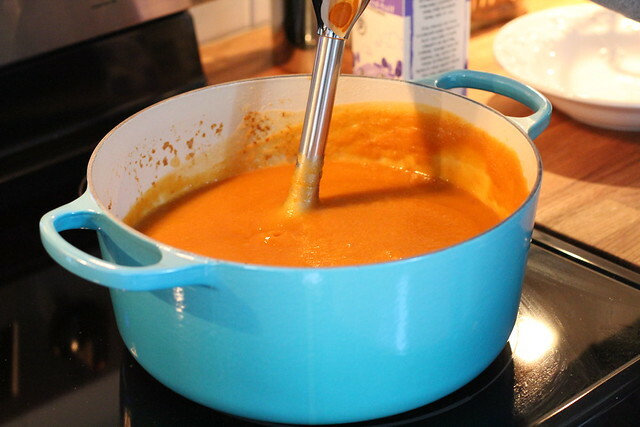 There's nothing like making a big pot of soup on a cold winter's day to really warm you up. In particular, I find that Sundays are my favorite time of the week to cook, and I love making a large enough quantity of a recipe that we'll have leftovers to get us through the majority of the week to come. 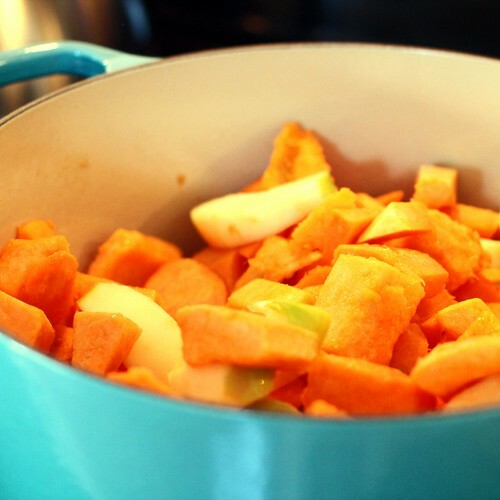 This Sunday was no different, as I opted to make one of our favorite recipes -- Ginger Apple Squash soup. I love this recipe for several reasons: it's pretty quick, pretty easy, very healthy, and makes ten servings, providing us with several days worth of healthy meals for the coming week. With butternut squash becoming more difficult to find this time of year, I knew I wanted to get one more run in before it's replaced by summer's produce selection. In our house, we're pretty much addicted to butternut squash, and haven't yet had our fill. I like to start by placing my large soup pot (a Christmas gift from my in-laws that I'm just loving!) on a cold stove with no heat, assembling my ingredients on the counter, and arranging my fresh items on a large cutting board. This allows me to get completely organized without feeling rushed or frantic during the actual prep process. To start, one of the most important steps in the overall success of the recipe is easily the simplest. 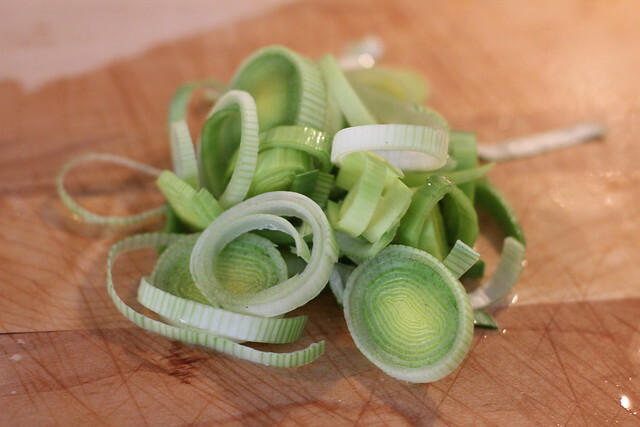 Thoroughly rinse or soak the leek in water to remove the grit. This is a step you'll want to take your time with, as leeks are like magicians. Just when you think they're clean, you'll find they have a little something hidden up their sleeve. 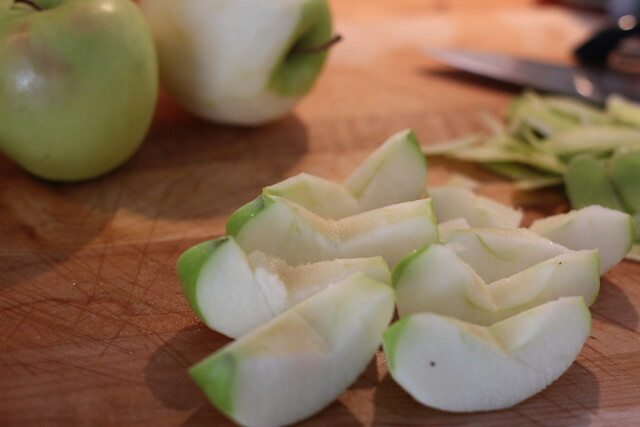 Once clean, discard the upper green section and chop the lower white end. 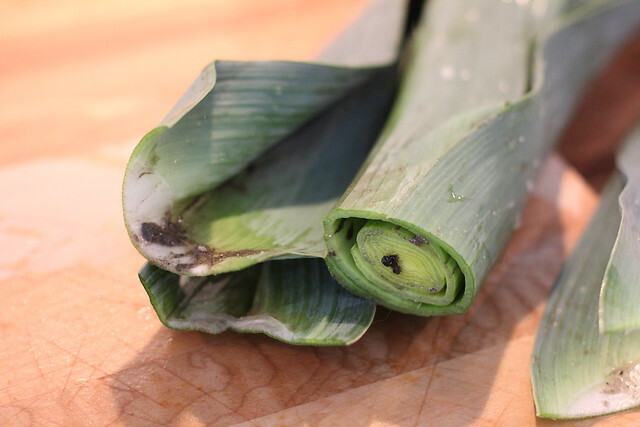 Chop the leeks into small sections and toss the them into your pot. Next up, trim a section of fresh ginger to remove the tough outer skin. 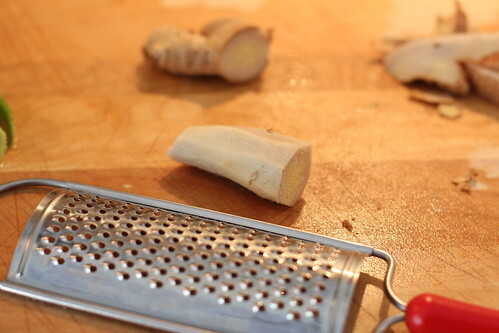 Using a microplaner or grater, grate 1 1/2 tablespoons of the ginger directly into the pot. You can use the ginger in a tube if you're looking to save time, but make sure the ginger is fresh. 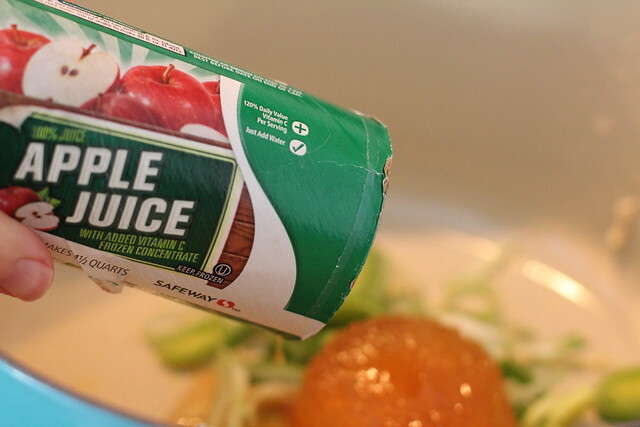 Next, add 4 ounces of frozen apple juice concentrate to the leek and ginger, turning on the heat to medium. 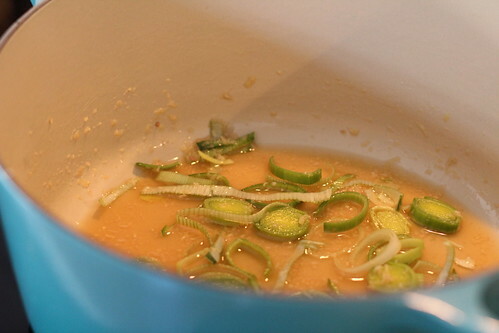 Bring the mixture to a simmer, and allow the contents to cook, covered, for 10 minutes or until the leeks are tender. 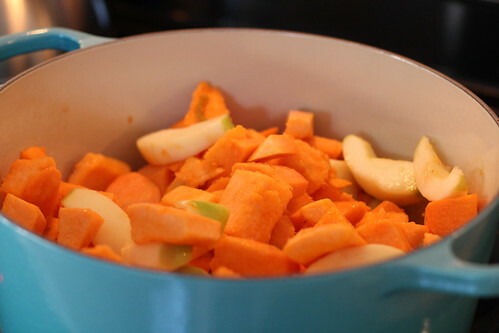 Next up, peel and cube the butternut squash into chunks. Since we're at the tail end of butternut squash season, all I could find at the store this weekend was the already peeled and cubed squash. It made this recipe much easier, but foretells the end of the season and is a lot more expensive to buy it this way. 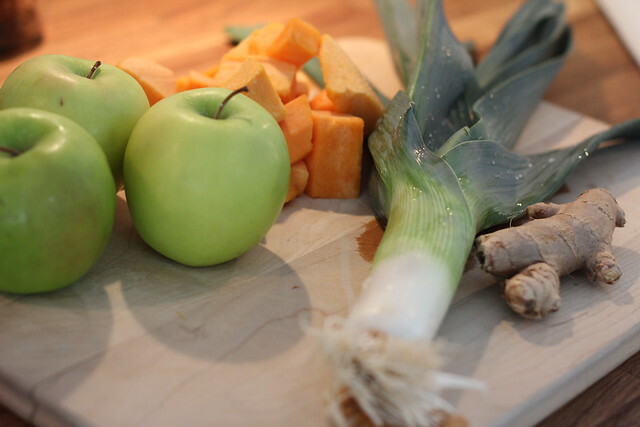 Once the leeks are tender, add the apples and squash to the pot. 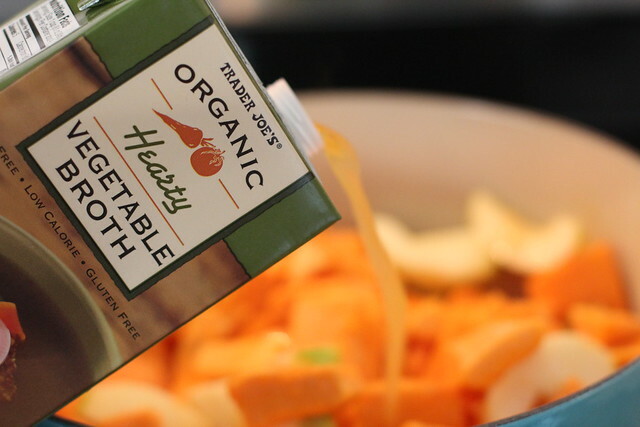 Cover the contents of the pot with approximately one cup of the vegetable broth. 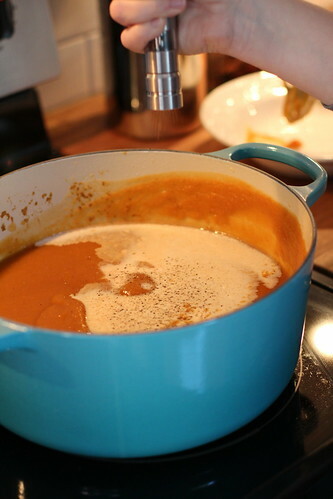 With the heat set to medium/medium-low, cover and allow the combination to simmer for one hour. This will give you plenty of time to clean up, or perhaps drink a cup of coffee and read the newspaper while your spouse does the dishes. 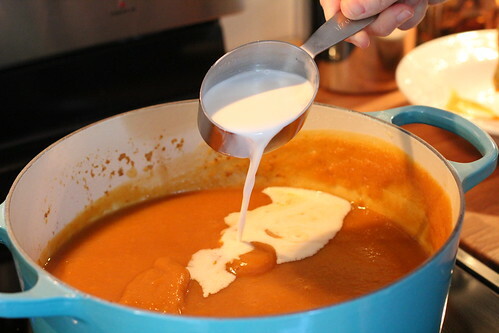 Once the squash is very tender, puree the mixture using a handheld immersion blender or by pureeing the soup in small batches in a blender or food processor. Personally, I feel the immersion blender is one of the best kitchen tools I own. I find it's a huge time saver that allows me to completely puree anything in the pot rather than having to transfer batches to the blender, wash the blender, and scrub down my kitchen cabinets after exploding said mixture in the blender multiple times. The final step is to add 1/2 half cup fat free half and half to the pureed mixture. The half and half lends a indulgent velvet texture to the soup, without the fat of butter or heavy cream. Paula Deen may not agree, but I promise you won't miss notice the substitution! Season the soup with 1/2 teaspoon salt and pepper (or to taste). 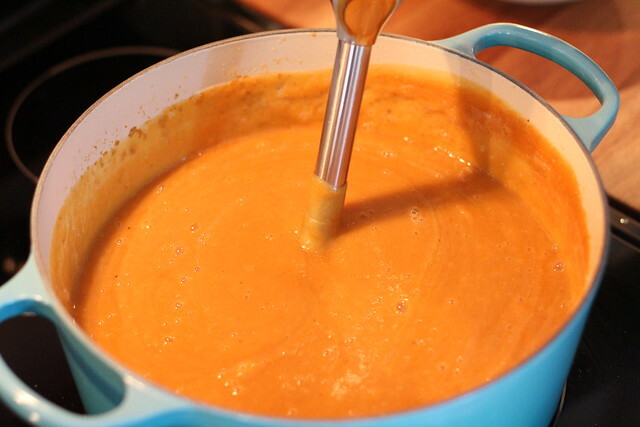 And give the soup one final "zap" with the immersion blender to ensure a creamy, even texture. 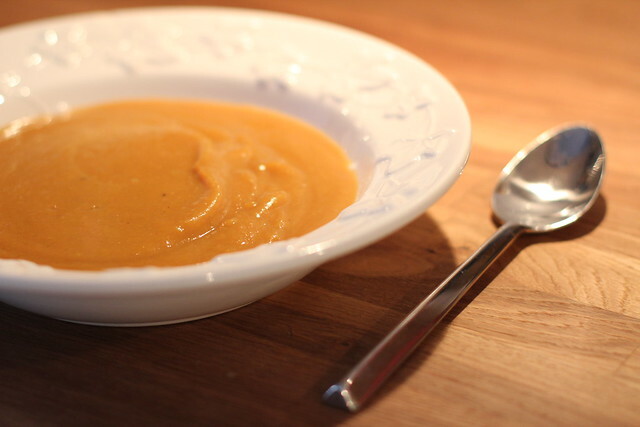 Now all you have to do is ladle out a bowl of this sweet and gingery soup to enjoy the fruits (and veggies) of your labor. Since this recipe makes ten servings, I like to pre-portion out each serving in individual storage containers. As we run out the door each morning to get to work, lunch is already packed and practically ready to go. 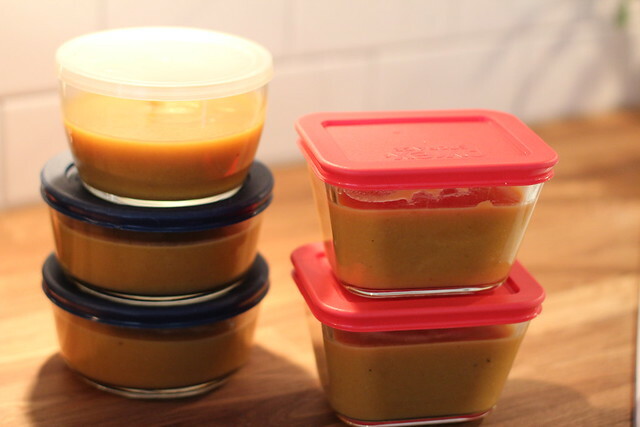 So there you have it -- one of our favorite soup recipes and my trick to making healthy weekday meals a snap. 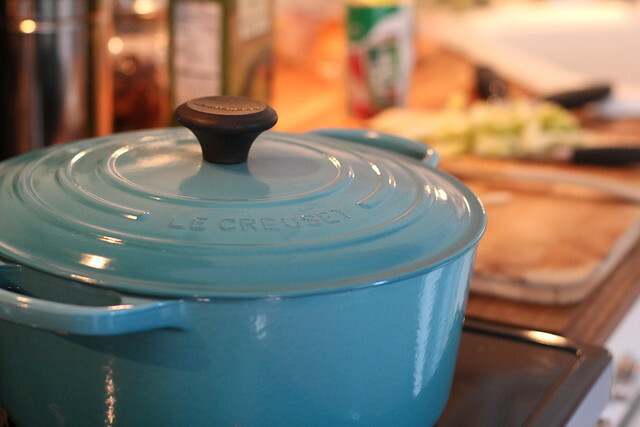 Do you have a go-to cold weather recipe? Maybe a tip on packing easy lunches or assembling make-ahead dinners? With time at a premium, I'm always interested to learn new ways to make the work week just a bit less hectic. Totally agree about the immersion blender--I've used it for crockpot recipes. The crockpot is my go-to appliance. I also use it to cook things to re-portion for the freezer (such as chicken, dry beans, pulled pork). 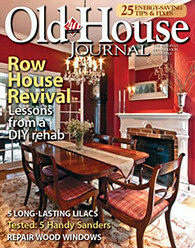 It's a great moneysaver and timesaver. Since you've not signed in yet, you will need to fill in your name and email below. If you have a Facebook account, save yourself a step and use Connect to login. You can use Markdown syntax in your comment. And you can also use lots of Emoji! Click on any of the items below to insert it into the comment area.